We maintain an extensive portfolio of employees, freelancers and partnerships to handle any job. 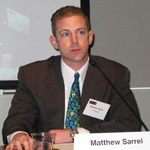 Sarrel Group was founded in 2005 by Matt Sarrel, a Certified Information Systems Security Professional (CISSP). Matt currently writes for a number of publications and websites including PC Magazine, eWeek, TechWeb, Intelligent Enterprise, Information Week, and YRB Magazine. Matt has written for and spoken to numerous international audiences about information technology and information security. He participated as an expert in two Federal Trade Commission workshops, one about spam in 2003 and one about spyware in 2004. Matt was a Technical Director at PC Magazine Labs for four years, where he led all testing conducted by the Applications (video/graphics/audio editing, accounting, and web browsers), Enterprise and Development Software (Java and .NET application development and performance testing, SQL Databases, enterprise security solutions), OS and Utilities (Windows XP, Linux, annual Utility Guide), Network Infrastructure (security hardware and software, remote access/VPN, vulnerability management) and Wireless LAN (access points, wireless management frameworks, wireless peripherals) teams. Prior to joining PC Magazine, Matt served as Vice President of Engineering and IS Manager at two Internet startups. Prior to his experiences in the world of Internet startups, he spent almost 10 years providing IT solutions in medical research settings, beginning his career as a network administrator and ultimately serving as Director of IT for the New Jersey Medical School National Tuberculosis Center and CIO for the HIV Educational Exchange for Healthcare Workers in Vietnam project. Matt has earned a BA (History) from Cornell University and an MPH (Epidemiology) from Columbia University. For more information see Matt's personal website. This article on starting a business highlights Sarrel Group and details some early history of the group. Sarrel Group is migrating its layer 4 through 7 test methodologies to the BreakingPoint platform in order to take advantage of its powerful multi-protocol, high-throughput and live security attack capabilities. This report offers a detailed look into Sugar Enterprise 4.5 On-Demand Customer Relationship Management (CRM) software. Reports like this one are essential tools in product development as well as marketing and sales. They can also be used to guide PR efforts and sometimes form the basis of a reviewer's guide.